Hockey is the “fastest of team sports,” but was also a great social event in Canada during the 1870s and 1880s. Between periods both the players and the fans would mingle and socialize. There are many differences between both the layout of the arena and the game itself from the 1800s to modern day hockey, but “the way goals are scored has never changed.” The player tries to hit the puck into the net and the goalie tries his best to stop the shot. The Pacific Coast Hockey Association (PCHA) was formed and the National Hockey League soon followed in 1917. Oddly enough, even though hockey was wildly popular, the leagues soon found themselves going broke. In 1925, the US teams began to form and the sport became even more popular than ever. Hockey is a “game of speed, skill and ‘smarts,’” and over the years fans have seen some jaw dropping goals. In this book you’ll get to take a look at some of the “best ever” goals. You’ll get to take a look at the likes of Frank McGee, a man who was blind in one eye, but managed to score a whopping 14 goals in a Stanley Cup game. And then there was Maurice “Rocket” Richard. He lay on the ice in a pool of blood. His fans were positive he was dying. No spoilers here, but you’ll be shocked at what transpired next. Of course few will ever forget Team USA and their “Miracle on Ice.” No doubt, some very astonishing things have happened in the world of hockey. The young hockey fan will enjoy taking a look at some “Hot Shots” and learning about some amazing shots and take a look at players who can execute them well. You’ll get to take a look at the slap shot, the one timer, the snap shot, the wrist shot, the backhand, deflections, and rebounds. Take for example Gordie Howe and one of his specialties. “In practice, he could stand near his own goal and fire wrist shots over the glass at the other end of the rink. The puck would still be rising when it clanked against the empty seats!” You’ll also get to take a look at some remarkable scoring plays, you’ll get to take a look at some unusually great scorers, some records that will be tough to break, and will read about the future of the sport. This magnificent look at the world of hockey, will mesmerize both young and old hockey fans alike. This book had an underlying tinge of excitement that kept me reading and wanting more. This is not an instructional manual, but there is some information about the different types of shots that young people may glean some information from. I loved the many portraits of famous players and the highlights of their careers. There are many informative sidebars scattered throughout the book that will tell the reader about historical figures like Lord Stanley and, in the Collector’s Corner, highlight numerous players. The material was well researched and nicely presented. There are numerous photographs and reproductions of hockey cards. In the back of the book there is an index and additional recommended book and website resources. 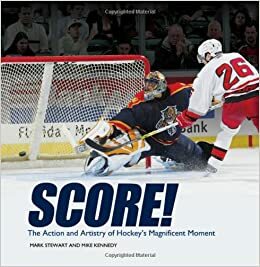 Quill says: If you are a hockey fan or have a youngster who wants to know more about some “magnificent moments” in the world of hockey, this is one book you should consider!